available on your PC via Google Chrome. Big news from Google today: Google Now, the company’s powerful automated digital assistant services, has finally arrived on your PC via the Chrome Internet browser. If you haven’t used Google Now, you’re missing out on the future of technology – albeit a somewhat creepy future where your smartphone knows everything about you. Google Now, without need of much input of you, learns where you live, where you work, and what appointments and travel you have scheduled. It then offers up predictive cards – how bad traffic is on the way to work, the day’s temperature where you are and where you’re going, sports scores for teams you’ve shown interest in and local restaurant recommendations, just for starters. To enable Google Now in your browser, you’ll need to be signed in to Google while using the Chrome browser. If you’re not signed in, do so by clicking the Chrome menu button (three horizontal lines) on the browser toolbar and enter your account details. 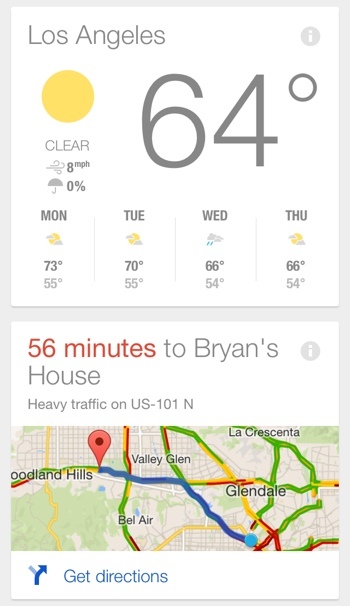 Don’t worry if you don’t see Google Now cards just yet, though. According to the company, a rollout is beginning today and will continue “over the next few weeks.” Of course, if you can’t wait, Google Now cards are available on your iOS device, on your Android device and through the Google Chrome Beta browser. You can learn more about Google Now on the Google website.